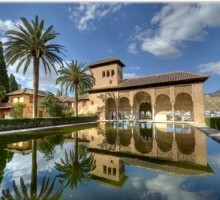 Activity: Guided tour to Alhambra. Services: Official Tourism Guide + Tickets. Departure:Date to be chosen by the customer. Time: To be chosen by the customer. Start Location: Main entry to Ahambra. Conditions: Book at least 48 h. advance. Cancellation fee: 100% for less than 48 hours notice or no-shows. Tickets included in the price.Languages​​: Spanish, English, French, Italian (to be confirm), Portuguese (to be confirm), Russian (to be confirm).Observations: Timetable: from 15th October to 14th March, Day visit Monday to Sunday from 08:30h to 18:00h. Night visit Friday to Sunday until 21:30 h. // From 15th March to 14th October, Day visit Monday to Sunday from 08:30h to 20:00h. Night visit until 23:30h. Available under request. E-mail confirmation by Incoming to Spain. 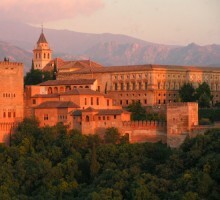 The Alhambra is an Andalusian palace located in Granada. Formed by a group of palaces, gardens and fort that housed a true city within the city of Granada, which served as shelter to the monarch and the court of Kingdom of Granada. 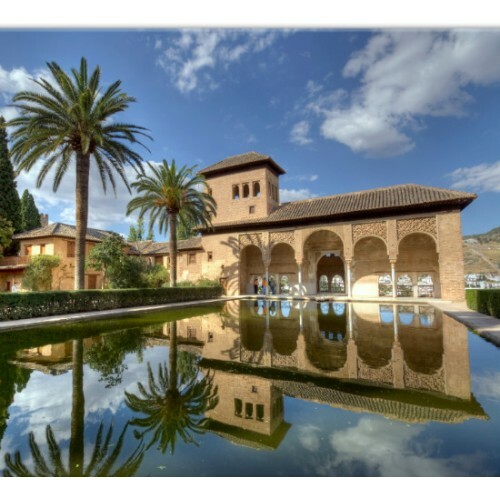 Its appeal, as in other Muslim works of the time, lies in the interior, the decoration is among the peaks of Andalusian art and their localization, creating a new landscape but fully integrated with the existing nature.